50ml of k pak shampoo. 50ml of k pak conditioner. Herbal Essences. For Coloured or Highlighted Hair. PROVOKE - Professional Hair Care. TOUCH OF SILVER COLOUR CARE SHAMPOO 200ml. for BLONDE, WHITE OR PLATINUM HAIR. Optical brighteners and Anti-oxidants instantly boost shine and keep hair colour. bright and rejuvenated, resulting in fresh, healthy, great looking hair. 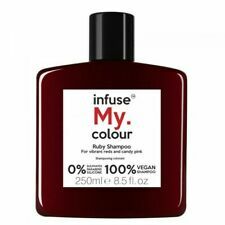 An intense, sulphate free, shampoo specifically formulated for use on super–lightened, grey or bleached hair. Changes hair colour to silver/ash tones. Apply on wet hair. Re-apply if needed. 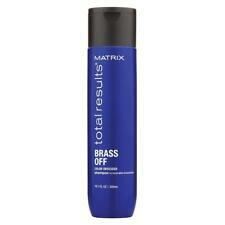 The shampoo is designed for a systematic care of hair with blond or grey tones. 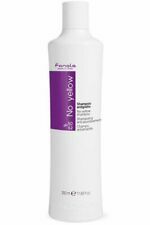 Fanola No Orange Shampoo 1000 ml Colour toner within a shampoo. Fanola has you covered with their line of No Orange Shampoo. Shampoo give you a little more grace. Shampoo Tones Down Unwanted Yellow Hair. Royal Moroccan silver shampoo gives your hair clarity and shine. The special anti-yellow effect reduces unwanted yellow tones for blonde hair while maintaining the condition of gray and white. Royal Moroccan Silver Shampoo 300 ml. 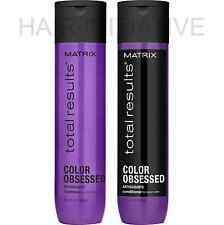 MATRIX NEW TOTAL RESULTS COLOR OBSESSED SHAMPOO 300ml & CONDITIONER 300ml A Great Colour Protector. 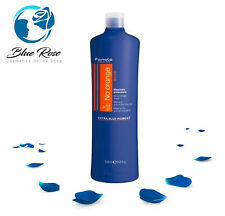 Color Obsessed Shampoo 300ml. Color Obsessed Conditioner 300ml. 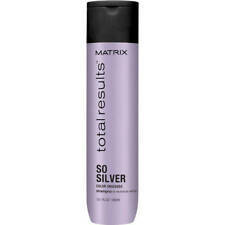 Total Results Color Obsessed Shampoo by Matrix is perfect for coloured hair. Quickly neutralises stubborn yellow undertones on lightened hair at the backwash for cool blonde results. This wash provides a gentle cleansing action and instant tonal deposits to neutralise underlying warm tones. Fudge Clean Blonde Violet Toning Shampoo 500Ml Coloured blonde hair can occasionally take on an unwanted yellow, brassy tone. Fudge Clean Blonde Violet Toning Shampoo balances out the yellow tones from the hair, and leaves hair hydrated and replenished. Apply a small amount of shampoo to wet hair, lather, rinse and repeat if necessary. A gentle cleanser that washes hair without stripping colour. Natural Botanical oils maintain strength and enhance body and shine. NEW SACHAJUAN Haircare Colour Protect Shampoo 250ml 8.4 fl.oz. This Swedish range of haircare products, created with Ocean Silk Technology, is truly natural and unique. To use: Massage a small amount of Sachajuan Colour Protect Shampoo into wet hair. Rinse thoroughly. Leave hair looking fuller and thicker with this Shampoo for Natural Thinning Hair from the Serioxyl range by L'Oreal Professionnel. Serioxyl is a new range from L’Oréal Professionnel with products that contain Stemoxydin™, Neohesperidin™, Glucoboost™, Incell™ and Intra-cylane to create beautiful hair that looks thicker and denser. KORRES SUNFLOWER & MOUNTAIN TEA Shampoo. With organic plant extracts from the island of Crete. Sunflower and Mountain Tea: Sunflower and Mountain Tea, natural source of polyphenols, protect hair colour and sheen from frequent shampooing, styling and sun exposure. Hydrate Shampoo. Hydrate Condition. The exclusive AntiFadeComplex maximizes colour retention. Schwarzkopf Professional BC Bonacure pH 4.5 Colour Freeze Micellar Rich Shampoo (1000ml) gently yet effectively cleanses porous, coloured or highlighted hair which has been over-processed. Directions of use: • Apply to wet hair. TIGI Catwalk Fashionista Violet Shampoo 750ml: This sulphate-free shampoo enhances blonde shades and reduces brassy tone effects. To use: Work through wet hair, leave in for up to 10 minutes depending on desired effect and then rinse well. CAMOMILE SHAMPOO INTEA BLOND REFLEX 250ML CHAMOMILE SHAMPOO BLOD HIGHLIGHTS FLOWER. It contains high concentration of natural extract of chamomile flowers and active ingredients that care for the scalp and provide natural or dyed blond hair shine and softness unique, retaining its color. Bleach London Bleach Live Forever Shampoo Hair/Colour/Protect/Enhance/250ml/NEW. Condition is New. Dispatched with Royal Mail 2nd Class. "Hair dye doesn’t live forever – but you can prolong its lifespan and keep things as vibrant as possible with BLEACH London’s Live Forever Shampoo. Gentle and nourishing, it features UV filters to deflect the sun’s damaging rays and sunflower seed extract to impart much-needed moisture."